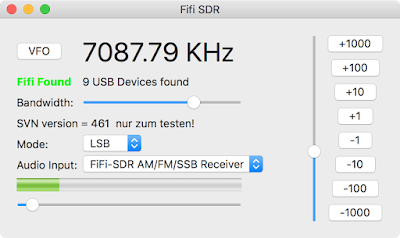 One of the intriguing things about the Fifi SDR is that as well as I/Q output via an in-built USB sound device it also has the ability to demodulate built right in and that audio output appears as an additional sound device. The code is based on rockprog and Apples AVRecorder sample. So with just the Fifi box and this software you have a simple radio that tunes all of HF and plays through your Mac's audio. If you want the full, waterfall style, experience then I recommend DSP Radio which also supports Fifi. You can download the alpha app here. As I haven't signed it you will need to right click (control click) and choose Open the first time to open it. Be careful not to choose built-in audio from the input device and turn up the volume or you'll get feedback. Speaking of feedback, let me know if you find this useful. A tuning slider - I'm still experimenting to get this working nicely. On my device anyway, the frequency is off. I'll have to look at how to fix this. The FiFi SDR Control App looks like a great way to control the frequency of my SoftRock RXTX from my MacBook. Unfortunately, OS X "Sierra" does not detect the SoftRock USB interface. I also tried the rockprog program with the same results. Do I need to install a special USB driver on the Mac? Thanks for the comment. I had it working on El Capitain but am running Sierra. I'll give it a go and see what's going on. Thanks for getting back to me. I just received my new MacBook Pro today! I plugged in my SoftRock RXTX and selected About This Mac > System Report > USB. The SoftRock RXTX was listed as "DG8SAQ-I2C". I launched FiFiControl and it works! The problem recognizing the SoftRock USB interface occurs only on my old 2010 vintage plastic MacBook running MacOS Sierra. Thanks for creating the FiFiControl app. I am building a Peaberry SDR and hope to put it on the air soon. 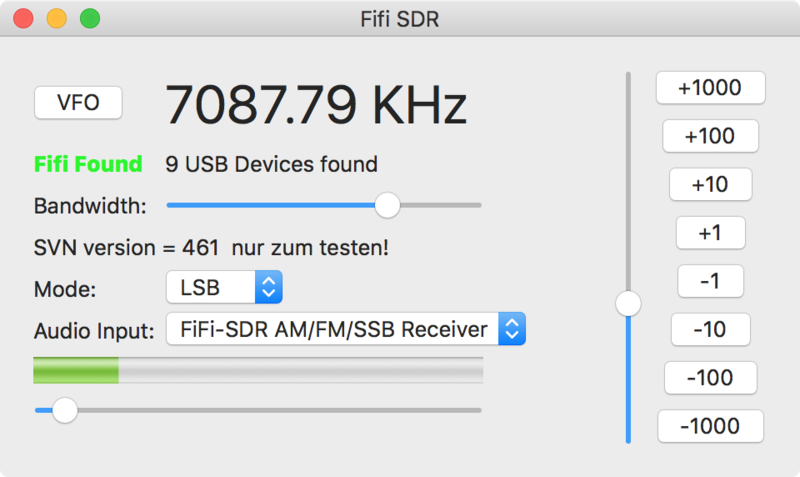 I find my Fifi SDR is not very sensitive compared to the SDRPlay so I haven't been using it for a while. Perhaps it needs better front end filtering or a pre-amp. How is yours?